Every summer since 2007, Fellows for Peace has brought 100 aspiring and experienced peacemakers to the Middlebury Language Schools and the Middlebury Institute of International Studies at Monterey, where they build skills in foreign language or policy studies. 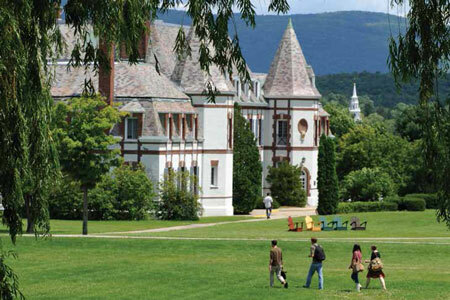 The Language Schools at Middlebury College in Vermont and in California, at Middlebury at Mills, are recognized around the world as premier sites of language study. An environment of complete immersion produces cultural fluency in addition to linguistic competence, and participants are encouraged to live the language they are learning. Davis Fellowships for Peace are available in all of the Language Schools: Arabic, Chinese, French, German, Hebrew, Korean, Italian, Japanese, Portuguese, Russian, and Spanish. The Fellows for Peace program also supports Davis United World College Scholars and others at the Middlebury Institute of International Studies. Starting in 2018, Fellows can attend one of two programs, the Summer Intensive Language Program (SILP) or the Summer Peacebulding Program. SILP offers an eight-week program for Arabic, Chinese, French, Russian, and Spanish. Davis Fellows aspire to use language to resolve conflict and contribute to more peaceful relationships between people or communities. Students and practitioners in the field of conflict, peace, development, and security studies are also eligible to apply for the three-week Summer Peacebuilding Program. This program combines peacebuilding theory (including justice, trauma-healing, and reconciliation) with practical skills and feedback from experienced practitioners.